I have mentioned this in previous posts, with the status of our economy; and scams which are reported in the news, it is important to remember the following as California residents when purchasing any type of travel from Calfornia Travel Businesses. Businesses selling any type of travel to residents of the state of California need to be registered sellers of travel. Information is found at the Office of the Attorney General website. This CST# should be displayed on any form of advertisement (websites, flyers, etc) and is renewed annually. 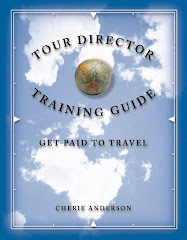 If you are purchasing a trip from a membership organization, or event planner, they should still display the actual seller of travel business of which the purchase is through. Sometimes, this third party is not told about this procedure. An important reminder, through the current trends of social networking. Be open, use this to ask questions up front. I have personally heard of people's stories where monies are lost. Please research seller's of travel in advance, before your purchases. This does include all transportation (air, ground, and cruise, etc) companies, tour companies, and the retail travel agencies, i.e. any business selling travel and is a different registration from transportation vehicles with a TCP#. Although, the latest CA regulation requires transportation companies to have both. Of course, this may not stop every criminal, it is certainly a procedure in place to assist. One procedure to remember is that registered sellers of travel are required to set aside consumers dollars before travel is started, and refunded, if trips are cancelled for any reason. Again, details may be obtained from the CA Office of the Attorney General. There is a similar regulation in the state of Florida and people may search for their information. This is in place to protect consumers and any registered seller of travel is required to explain what this is to you. Always, be safe and enjoy your trip. It is important to share this, thanks. End of soap box. Oh, and yes, you will find this CST# displayed in my About Me on this blog. There are many methods to increase your skills through education and congratulations for those self-starters (entrepreneurs) that take on-going classes in Adult Education classes, Recreation, Community Colleges, Technical Training courses in private schools, online seminars on the web, etc. What happened to the idea of employers (companies) providing opportunities for training to candidates and employees? There are many stories of (from 10-20 years ago) workers being trained as programmers, sales, etc through employers. What happened to this? Perhaps this is an idea which might be given to offset the lower wages which are being offered by employers now? A key question in interviews today is, "Do you have this certain software or skill?" How does one get the experience? A reply question to the hiring person may be, "what equivalent skill might be acceptable?" Happy Friday! ~ remember, take a short trip to renew yourself.